Ring silver & gold. Page 2. Ring silver & gold. ﻿Page 1.﻿ Page 3. Page 4. 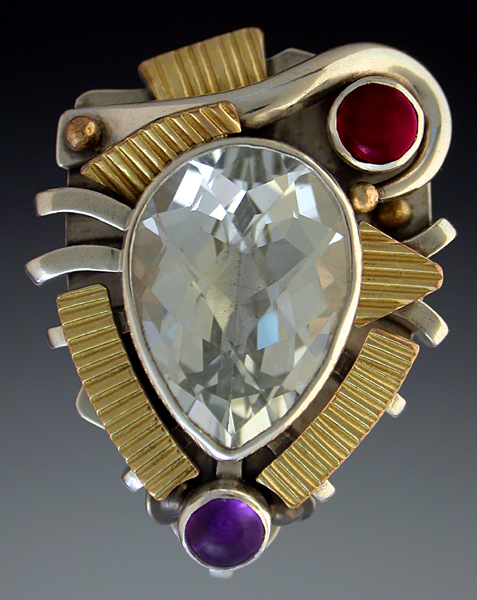 Dimensions: 1" 1/4 x 1" x 7/16"
Materials: Sterling Silver and 14K Gold set with White Topaz, Amethyst and Garnet. 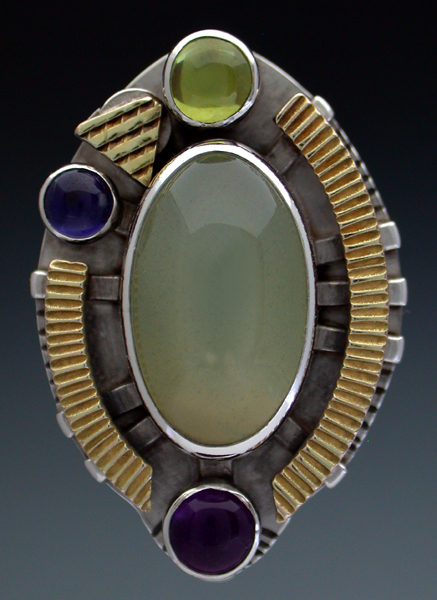 Dimensions: 1" 1/16 x 1 5/16" x 1/4"
Materials: Sterling Silver and 14K Gold set with Amethyst, Peridot and Blue Topaz. 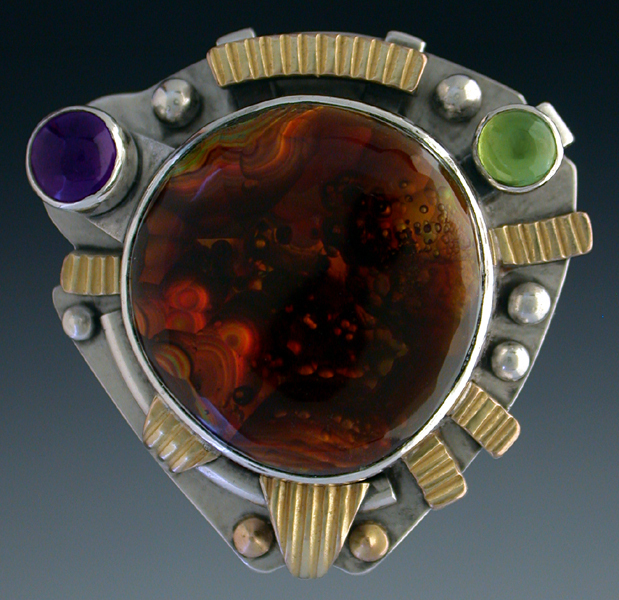 Dimensions: 1" 1/8 x 1" 1/8 x 5/16"
Materials: Sterling Silver and 14K Gold set with Fire Agate, Amethyst and Peridot. 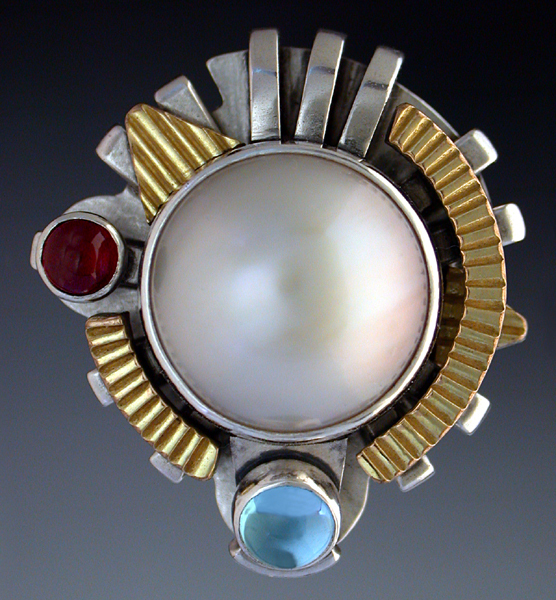 Dimensions: 1" 1/16" x 1" x 7/16"
Materials: Sterling Silver and 14K gold set with Mabe Pearl, Blue Topaz and Garnets. 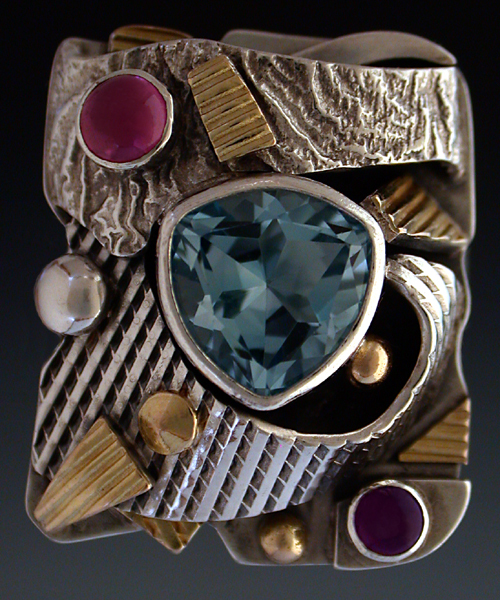 Materials: Sterling Silver and 14K Gold set with Blue Topaz, Garnet and Amethyst. 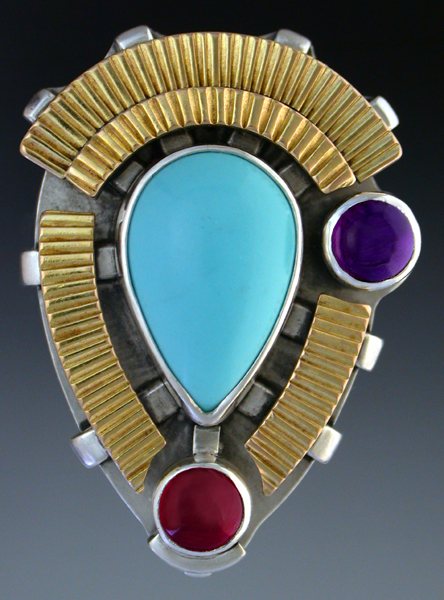 Dimensions: 1" 3/16 x 7/8" x 3/8"
Materials: Sterling Silver and 14K Gold set with Sleeping beauty Turquoise, Amethyst and Garnet. 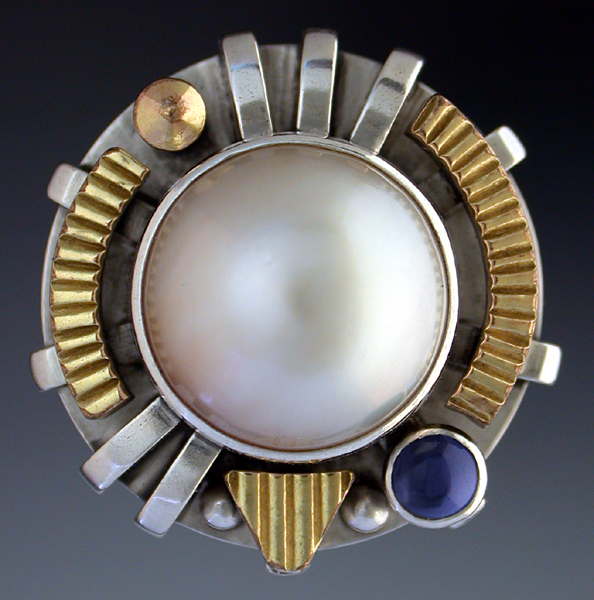 Dimensions: 15/16" x 15/16" x 7/16"
Materials: Sterling Silver and 14K Gold set with Mabe Pearl and Iolite. 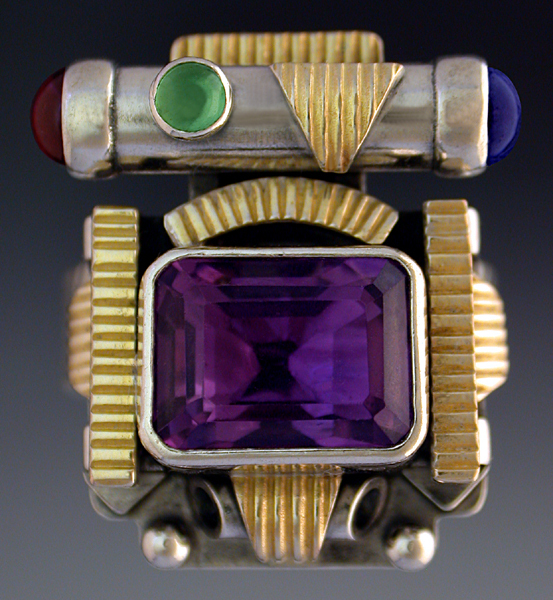 Dimensions: 1" 7/16 x 1" 3/8 x 7/16"
Materials: Sterling Silver and 14k gold set with Amethyst, Ruby, emerald and Iolite. 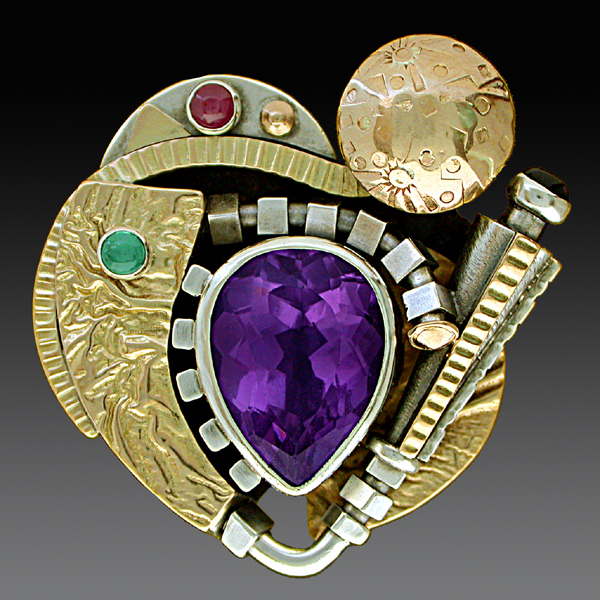 Dimensions: 1" x 7/8" x 3/8"
Materials: Sterling Silver and 14k gold set with Amethyst, Peridot, Garnet and Iolite. 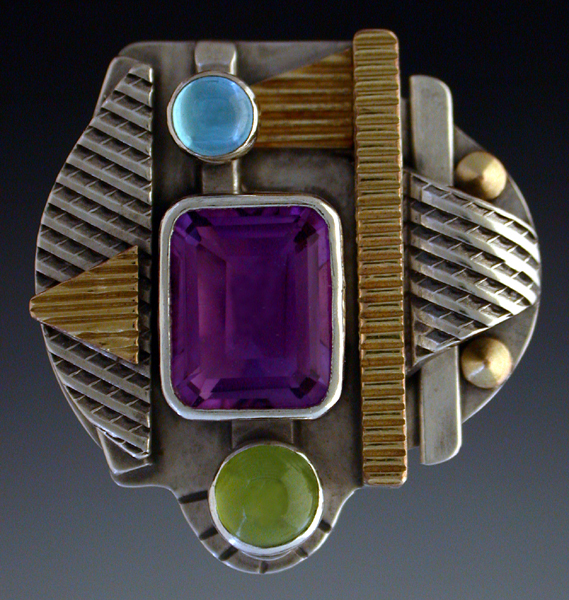 Dimensions: 1" 3/16 x 13/16" x 7/16"
Materials: Sterling Silver and 14k gold set with Amethyst, Peridot and Iolite.